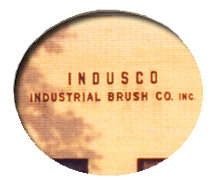 In 1946, The Industrial Brush Company began as a small family operated business. The company continues to be family owned in its third generation. Industrial Brush was started to take advantage of ideas and mechanical technology that the founders determined to be revolutionary to an archaic method of manufacturing brushes. Although the brush manufacturing industry had modernized, Industrial Brush's methods of brush manufacturing continue to be revered by the brush industry. Industrial Brush's manufacturing technology has now become known as Fineset and Tufted rotary cylinder brushes. Although the mechanics of manufacturing have changed very little over the past 50 years, the Fineset and Tufted cylinder brush has continued to be a necessary part of many higher end precision-brushing applications. Our Customers rely on us to manufacture brushes that meet and exceed high quality standards. Along with quality, it is our philosophy to keep our deliveries as short as possible, even though our customers are typically purchasing a custom made brush to fit a specific application. The Industrial Brush Company is committed to service of its customers. Without them, we would not be in business. Many of our present customers have been buying from us since our first generation. The ties between these companies remain strong and the commitment to high quality and service remains paramount. As new customers are developed, it is our goal that they also find a company that keeps its promise to provide the quality and honesty that has become our trademark through the generations.